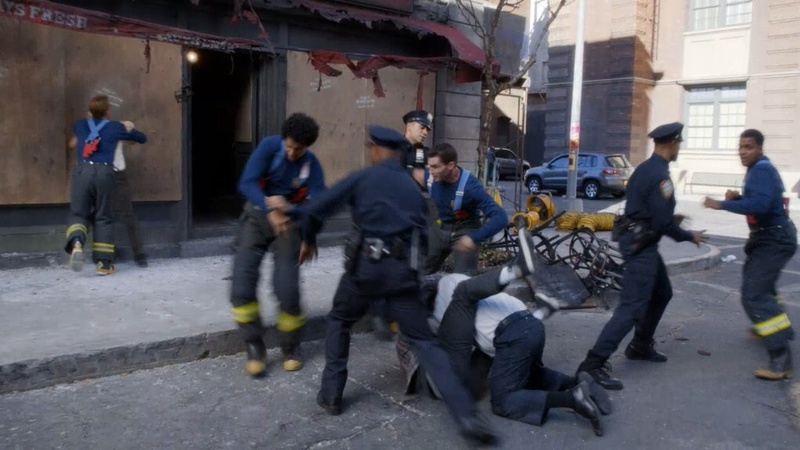 cops vs. fireman. . HD Wallpaper and background images in the Brooklyn Nine-Nine club tagged: photo brooklyn nine-nine cops vs. fireman fight sal's pizza season 1. This Brooklyn Nine-Nine photo contains রাস্তায়, শহর দৃশ্য, and শহুরে. There might also be সবুজ টুপিবিশেষ, বিশেষ বাহিনী, and অভিজাত সৈনিক.